Do you own a security camera but fancy an upgrade? Does your existing security camera have a blind spot, an important part of a room that it can’t quite see? A Pan, Tilt and Zoom (PTZ) camera might be just what you need. These cameras have a motorised lens that will move vertically and horizontally in order that you can see all of a room and not just the most important parts. Or you might crave a PTZ camera because you love to fiddle with gadgets and it will help you feel more like James Bond. What are “PTZ Security Camera”? Why do I Want to Install a PTZ Security Camera System? PTZ security camera systems are that future of security cameras. In the past, you wanted two or three cameras per room to monitor every angle, and avoid blind spots. But today, one camera will cover it all. PTZ stands for Pan, Tilt and Zoom. That refers to the fact these cameras can move freely to look at almost any angle around your house. And with the extra features now included in these systems, you won’t be disappointed. A customer once referred to it as “… a security camera on steroids!” and there is no better way to sum it up. What do you want to get in your PTZ security camera system? Here are a few features that you want included in your purchase. Firstly, you will want your PTZ to be able to move to see a wide angle. Most PTZ cameras will do this, but make sure it can see at least a 60 degree vertical angle and try to get over 300 horizontal angle. This should allow for most if not all of your room to be in sight. Resolution is also a must. If the camera is low resolution, it’s completely useless when tracking criminals. Luckily, most PTZ security cameras are at least 1080p, so always aim for high resolution. 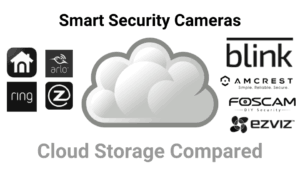 These cameras should all record either to a SD card, a inbuilt memory or to the cloud. But besides that, you also want one that live streams to your portable device, either a PC, tablet or smartphone. This will allow you to check on your house throughout your day. Peace of mind comes from knowing who is in your home at all times. Night vision is also a feature of almost all PTZ camera systems. But always check your package includes it before purchase. Night vision will allow your home to be monitored and safe even during late hours of the night. If you are out at night, you can open your smartphone and see everything clearly. Size and appearance should also be slick so as to avoid undue attention. So always think about your cameras appearance before purchase and installation. Is how well do PTZ Security Camera systems do their job? What are benefits and the disadvantages? Here is a list of the pros and cons of PTZ camera systems. By far the biggest pro for PTZ security cameras is the fact that they are PTZ. They can move on both X and Y axis and zoom in, allowing for high resolution footage of the entire room. They can even cover whole homes with just one or two cameras! This eliminates blinds spots and increases peace of mind. The first problem with PTZ cameras is the fact they cost more than your traditional security camera. And ones with night vision can cost even more. Power also will be more costly, as PTZ cameras take up more electricity than other cameras. So all things considered, who really wants to have a PTZ security camera system? Well, these systems are not for everyone. They are much more advanced than your traditional system and can do a lot more than most cameras, but they are far more expensive too. And so, the first ideal buyer might be a real security camera geek- those buyers who love gadgets with all the bells and whistles and who will happily spend hours playing with their camera. The second, are those buyers who fancy playing the lead role in an action movie and using the camera’s PTZ capabilities to their heart’s content. And finally, the third ideal buyer are people who have a large room or area to monitor and want a to buy one PTZ camera instead of a few non PTZ cameras. Over all PTZ cameras are wonderful, expensive compared to other cameras but coming with features that are well worth the cost. A great addition to your home security system and a wonderful gadget to have up and running. The Zmodo 1080p is a pan/tilt/zoom (PTZ) camera. With a horizontal rotation of 350° and a vertical rotation of 70°, combined with a 140° field of view, this camera has every part of your room covered. However, although this camera can pan and tilt it will not automatically track an object as it moves. As regards the price, it is certainly mid-range. The Zmodo 1080p Camera is a very good care, it is loved by most of its users. Most users have so many good things to say about it and it is rated highly because of its cool features and also its aesthetics. Overall it is a very good camera, reliable and durable. Those who have bought and used this product have nothing but praises for it. Its cost, picture quality and ease of setup places it on a class of its own. To top it all, it is loved because of its accuracy. However some users complain that the customer support is not up to standard. When you look at other pan-and-tilt cameras you may not be able to spot any physical difference between them and the Zmodo 1080p. The only difference may be the size because it is smaller. Its body is made of white plastic. It is sleek, solid and beautiful. This camera comes with a lot of features and many of these features contribute to its uniqueness. Power: AC lead but also has a short-term battery for when power goes out. Audio: It features a two-way audio system with an “anti noise” technology. Night vision: It has night vision that can view to as far as 30ft. Storage: Cloud storage. 12 hours free. Plans start from $4.99. Ideal Buyer: This is perfect for someone who is looking for a mid-level reliable camera. It has all the features and will certainly serve you well. With 345° horizontal rotation and 115° vertical rotation, the YI Dome 1080p can detect and follow moving objects. An auto cruise mode allows the camera to horizontally scan the room automatically or you can move between 8 presets. In terms of price, this camera is certainly entry level. The YI Dome camera is a great camera and many users love it because of its high picture quality, although some users are not fully satisfied with its sound quality but all in all it is a very good camera. Most users have showered praises on this camera stating how lovely it is, and how it helps them to keep an eye on their elderly ones and also their kids from different angles and the fact that it works well in cold temperatures. However some users complain that it only supports 2.4 GHz Wi-Fi Band. The YI Dome 1080p is not very different from other PTZ cameras in the market, it is made of black plastic material. So there is really nothing unique about its physical appearance. However, the camera is sleek and sophisticated. In addition, it is crafted in such a way as to add aesthetics to the room where it is placed. It so many amazing features and these features make it unique and different from other cameras. Motion Detection: Push notifications. Optional 6 seconds of activity alerts. Audio: Supercharged, two-way audio which features a hands-free mode that enables to have a two way conversation. Night vision: Advanced Night Vision,8 built-in 940nm infrared LED beads which means that there is no infrared “glow”. Field of vision: A 112° wide-angle advanced glass lens that is combined with 345° horizontal & 115° vertical rotation range to give a complete 360° coverage. This is the perfect camera for a buyer who wants a camera that is reliable and affordable. 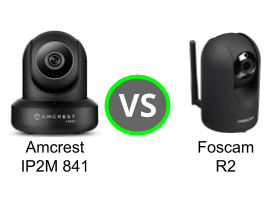 The Foscam R2C is a pan/tilt camera that allows you to remotely control your security camera to view at different angles thereby increasing your field of view. With a 100° vertical and 350° horizontal rotation, an auto cruise mode and up to 8 preset locations, this camera has great PTZ capabilities. The Foscam R2Cis not pricey, its price is most definitely entry-level. It is a very good camera and most of the users love it and go on and on about how it helps them and makes life easier for them. Overall it is an amazing camera that one can rely on for everyday use. A very high percentage of the users love the product, they say it is a great camera. Furthermore, the camera has a big angle view and is easy to set up. However some users complain that sometimes the camera stops working when you tilt to extreme angles and it only starts to function when you recycle power. The Foscam R2C is not different from other PTZ cameras, it is black in color and is made of plastic. There is nothing outstanding about it except the fact that it is compact and beautiful. It’s being compact gives some level of beauty and appeal. It has so many amazing features that makes it unique. And most of these features are the reason why it is dear to the hearts of majority of its users. 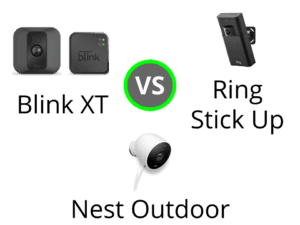 Audio: A 2-Way Audio dialogue on smart phone with IP camera. Field of vision: 350 °Horizontal and 100 ° vertical rotations for almost all angles. Ideal Buyer: This product is for someone who is looking for an entry-level pan/tilt camera that is reliable. Although this camera can pan and tilt, I cannot for the life of me find any details about its exact horizontal and vertical tracking capabilities. And the pan and tilt is not automatic- it will not track an object as it moves. However, users love the ability of this camera to pan and tilt and to be able to see so much. Although this is not one of the highest rated PTZ cameras, it is still very popular with most users. Having software to control it that works on their desktop computers as well as having the app. Some users complain that they have great difficulty using the app on their phones because it is not very responsive. Field of vision: 90 ° field of view. Exact horizontal and vertical rotations not specified for almost all angles. With a 360° horizontal and a 93° vertical rotation not only has the Wyze Cam Pan got everything covered but it promises to complete a horizontal pan in under three seconds. Also, four locations can be bookmarked so that you can quickly view the parts of the room that really matter to you. And it comes as no surprise that users love its scanning abilities! In terms of price this gadget is simply amazing and very low. Hands down this is the most highly rated pan and tilt camera in my comparison and has one of the highest rating that I have seen for any security camera. People are blown away at the ease of set up and the quality of the pictures that you get for such a low price. However, some users have complained about a recent upgrade that has led to their cameras dropping connections more easily. Anti noise technology and a built in amplifier help to make the quality superb. Night vision: 6 infrared LEDs with a night vision range of up to 30 ft. The camera can recognise 18 different shades of grey making the picture quality excellent. Field of vision: Not specified.